Watch a YouTube video? NSA knows. Write a Facebook private message? NSA can read it. Skype with a friend? 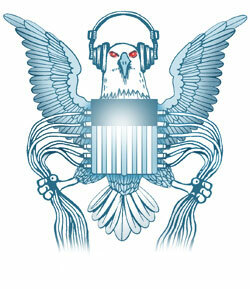 NSA can hear you. We always assumed that secret services in our todays world could access our online communication if they wanted. ECHELON monitors phone calls for over half a century now, most of our emails are not encrypted and sent through any number of servers worldwide and several reports in recent years suggested that the NSA has significant powers to spy on us. However, the revelation in recent days of a vast data collection program by the NSA, that gives them unlimited access to basically all communication online, without any court order, is shocking nonetheless. Under the program called PRISM, major internet companies grant the NSA a direct interface to all user data, including emails, calls, chats, file transfers and video (and rumoured: credit card data). Companies in the program include Microsoft, Google, Yahoo, Facebook, YouTube, Skype and Apple. No court order or special request is required. And this is heavily used: Over 2.000 PRISM-based reports are generated every month. In a first reaction after the publication of the programs existence, the White House stressed that this program is “just” targeted against non-US citizens and that no US citizens are surveilled. This is certainly not reassuring for all of us living outside the US since most of todays internet companies are based in the US. By the way, Dropbox is supposed to be added soon. So you might want to reassess your cloud storage strategy and at least add encryption to Dropbox or use providers such as SpiderOak. In combination with major NSA efforts to operate and build data centers to automatically analyze data, this development is troublesome and should change everyones lax attitude towards online communication. It seems like the NSAs UK counterpart GCHQ has access too! TechCrunch has an interesting article suggesting that PRISM might not be as big as everybody feared.